After the long game on Monday, it seemed that the chesstwitter community had enough of chess and twitter for a while. Obviously most followers had to go to bed or had dinner, and logged off, since the number of tweets after the game had finished was negligible. @category5Moron: “7 hours and still no pompom show yesterday, nor a drinks break. They should introduce half-time in chess”. As usual, a number of tweeters predicted the opening: @terendle: Will we see another new opening from Magnus today? I say no – perhaps a repeat of the QGD, but obviously a different line! @nigelshortchess: “Looks like a typical condom variation from Magnus: to be used once and thrown away”. 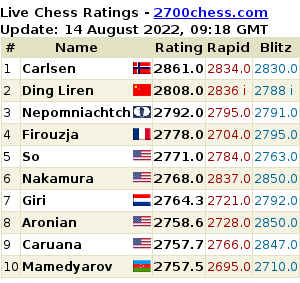 @chess24.com: 9…Re8 and the jacket comes off! GM Abhijeet Gupta aka @iam_abhjieet tweeted: “Inside news: Vishy does know about this Re8 move,Lets see how good his memory is”. He may need these pills to remember the games @GMJanGustafsson found with 9….Re8: “The greatest predecessors to play 9…Re8 are Janowski 1898, Marshall 1927 and Zviagintsev 2013. That counts as offbeat”. @FabianoCaruana: “Surprised Carlsen is playing such a risky variation.No doubt he analysed it,but it’s hard to account for all White’s options”. @anishgiri: “Magnus seems/acts hangover. Might not stop him from making an easy draw though”. @joshfriedel: “Judging by the nap Carlsen is taking, it looks as if he still thinks he is playing a Berlin”. @enthousiastchess: “♫ ♬ Wake me up when the endgame comes ♩ ♪ ♫ ♩”. @rajachess, aka world class grandmaster Teymur Rajabov: “World Champion has the right to sleep”. Easy day at the office for the handful of journalists in Sochi? @nigelshortchess: “A very dull game. Anand was surprised and ducked the critical continuations at an early stage. Not fatal, but tempus fugit”. @GMRobinVK: “Magnus looked extremely tired today, incidentally he also has to take a doping test.. hm…”. Does the doctor check if Vishy took some of the memory pills? There is a rest day on Wednesday: @reachsvara: “Ever since that Apple was bitten, “What will you do during Rest Day?” has ALWAYS puzzled mankind”.